In all sports, greatness is defined in many different ways, often with championships. With the Breeders’ Cup World Championships just a mere three months away, this is the time of year where horse racing’s most talented horses begin to emerge on the road to the year-end Championships. When I think of a champion, I think of versatility and character: Versatility being the ability to adapt to different situations and character being the ability to overcome adversity. One filly who is well on her way to being a champion is Monomoy Girl. 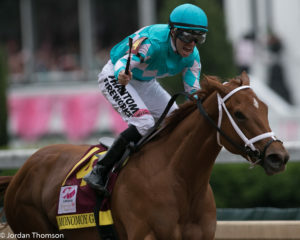 Monomoy Girl has been nothing but spectacular since she set foot on the Indiana Grand Turf Course last September. She romped while going six-wide around the Indiana Grand lawn. She’s continued to improve with every single race and every single challenge. The daughter of Tapizar has shown her versatility with closing scores on the turf, front running wins on the dirt, as well as closing wins on the dirt. 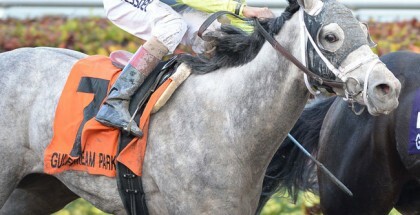 The Brad Cox-charge has shown she literally can do anything jockey Florent Geroux ask of her. Her character was displayed in the Kentucky Oaks (G1) when she broke from the far outside post, looked a challenge in the eye from Wonder Gadot in the stretch, and fought back to score in the biggest race in the country for three year old fillies.